Sims Metal Management is the world's biggest metals and electronics recycler working from 260 locations on five continents. 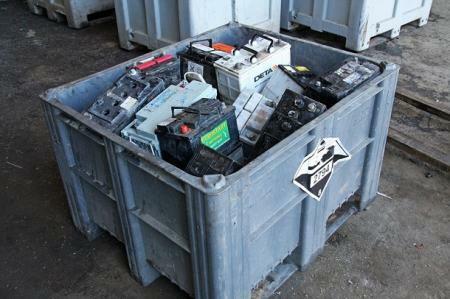 Its South Wales region handles some 80 tonnes, nearly 4,500, of used lead-acid batteries. These are recycled every month out of its sites in Crosshands, Skewen and Bridgend. Sims' South Wales chosen container is the Dolav Ace plastic pallet box as Sims demands a sealed container which does not leak battery acid, is strong and does not break. They have been collecting end-of-life lead-acid batteries for years and sending to a local company to break up and recycle. Now they select the Dolav Ace plastic pallet box, known for its strength by other battery recyclers, who call it the 'Battery' Ace', to do the job. First they tested a Dolav Ace for themselves. 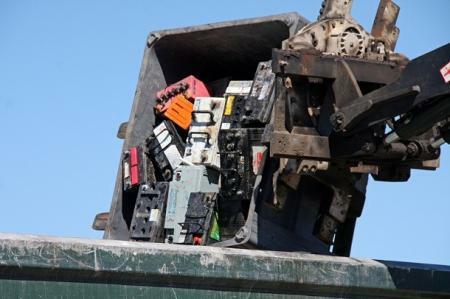 Sims regional manager, James Norman said, "Due to the hazardous nature of end-of-life batteries, Sims Metal Management needed boxes with several 'must have' qualities. Firstly the material of the box must be electrically insulated and resistant to battery acid. Secondly the boxes must be strong enough to be filled with batteries, which are exceptionally heavy due to the lead content, and be able to be stacked if necessary to reduce storage space. Finally the boxes must be able to be lifted and tipped through 180 degrees with a forklift truck, without causing damage to the runners or side mouldings. To date we have only found all of these qualities in one product, the Dolav Ace box. It may cost a little more, but will easily outlast other products - quite simply, it saves us money." Sims takes the Dolav Ace with lids. It has three moulded-in runners, is specified to 900kg and supports a static loading of 5000kg. Recent 'abuse testing' for Dolav by TUV SUD shows the Dolav Ace can withstand rough and abusive handling beyond its designed specification. That all contributes to a pallet box which can survive the demanding tasks of lead-acid battery recycling. The Ace pallet box pays for itself rapidly and then keeps paying back.